In this October 19 news article, Eugene Platt slams his GOP rival for a deceptive and regressive tax plan. Candidates for the state House District 115 seat found several areas of agreement, but laid out stark differences on tax policy, at a forum Monday at James Island Charter High School. In the Nov. 2 election, Rep. Anne Peterson Hutto, D-James Island, is seeking a second term representing the James Island-Folly Beach district, challenged by Republican Peter McCoy and Green Party and petition candidate Eugene Platt. Hutto and McCoy sparred several times over tax issues. Each said they would not support tax increases, but McCoy said he supports the “Fair Tax” plan, which would dramatically change taxation in South Carolina by scrapping income and other taxes in favor of a much higher sales tax rate. McCoy said that plan would help small businesses create jobs and would help individuals as well. He offered the Fair Tax as his solution to helping the poor and elderly manage medical and housing costs. “This will help our people, our elderly, by not having 7 percent of their income go to state income tax,” he said. Hutto and Platt blasted the idea that raising the sales tax would help the elderly and the poor. “Plain and simple, I would look out for the elderly and those on low incomes by holding the line on taxes,” Hutto said. Platt said consumption taxes are by definition regressive, falling hardest on the poor. In contrast to his opponents, he said he would be willing to consider raising the state’s income tax. “There are some of us … who could afford to pay a little more,” he said. Hello Greens! My campaign is a bit behind schedule due to the untimely death of my beloved father on July 2. But I am trying to catch up. Also, don’t miss the DEBATE that WIS is broadcasting Sunday at 10:30 a.m. The debate is on “Newswatch” and includes all three Attorney General candidates. I think I did a very good job of addressing some of the important issues that we are facing here in SC. Columbia, SC — Tom Clements’ U.S. Senate campaign will give supporters an advance look at a 30-second professional produced television ad “Where’s Jim DeMint?” at a private “meet & greet” gathering in Columbia on Tuesday, October 12, 2010 from 5:30-7:30pm. [Ad on request] The ad is the first of three TV spots aimed at DeMint. Media organizations wishing to attend the showing should contact the campaign for directions, as the event is not open to the public. The event is cosponsored by numerous Clements campaign supporters, including some well-known Democrats. The Clements’ statewide ad campaign is slated to begin on Monday, October 18th beginning with radio and television spots in most of the major media markets across South Carolina. “State-wide, support by Democrats for the campaign has been quietly growing and we expect these ads to solidify that support,” said Clements. Several advance radio spots were run during Saturday’s USC vs Alabama game on Saturday, October 9 and can be heard on the campaign website. 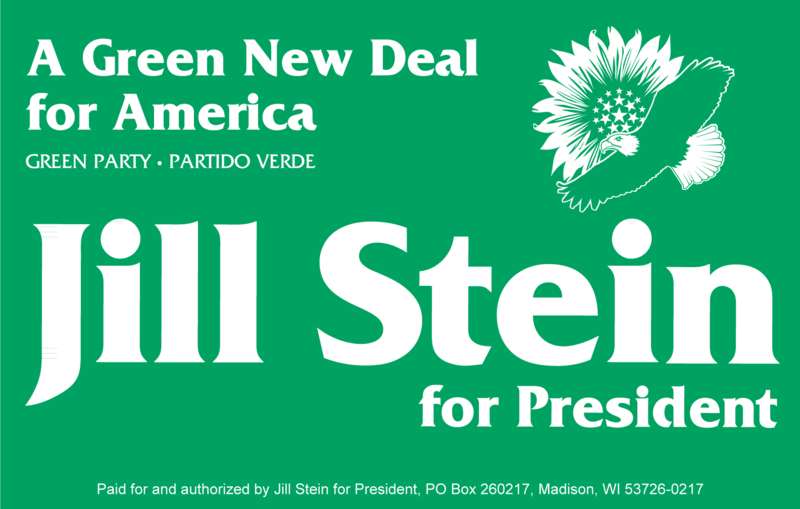 Also to be shown at the event will be a supporter-produced YouTube video entitled “It Ain’t Easy Being Green” which chronicles the triumphs and travails of a third party candidate. The song features “The Green Sisters,” who came together just to record the song. If you think you might be away from home, or are concerned about working on election day, lock in your vote now: vote absentee. In Person – Visit your county voter registration office , complete an application, and cast your ballot. You may vote absentee in person up until 5:00 p.m. on the day before the election. 2. Absentee Ballot Application – Receive it from your county voter registration office in the mail and send it back. It must be received by 5:00 pm on Friday, October 29. 3. Absentee Ballot – Receive it and send it back with your vote. 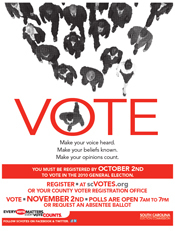 The county voter registration office must receive it by 7:00 pm on Tuesday, November 2. For the eighth consecutive year, postal customer Eugene Platt will buy over $1000 ($1320) in Breast Cancer Research stamps to honor his wife, Mary, who succumbed to the disease in 2003. The stamps are issued each October 1 by the US Postal Service to raise money for cancer research and to publicize Breast Cancer Awareness Month. James Island Postal Customer, Eugene Platt To Kick Off Breast Cancer Awareness Month by Buying $1320 in Breast Cancer Research Stamps on Oct. 1. (usps photo). October is Breast Cancer Awareness month. Friday morning, to kick it off, a James Island resident did something special, to honor his late wife. For the 8th year in a row, Eugene Platt walked into the post office on James Island and bought $1,320 worth of Breast Cancer research stamps… 2,400 stamps to be exact. It’s all to honor his wife, Mary, who died from breast cancer in 2003. Mr. Platt’s 8-year total is nearly $8,000. He donates the stamps to area organizations that fight cancer, to help with mailing costs. Eugene donation should encourage others to purchase the breast cancer research stamps. It’s important that we regard a cure for cancer as an achievable goal. Supporting public drives for research is an important way to do that. Eugene Platt is a long-time public servant on James Island. This year he is a Green Party and independent petition candidate for SC’s 115th House District [http://voteplatt.com].